Shimadzu's new double beam AA-6200 atomic absorption spectrophotometer recombines high performance and affordability. The double beam system provides the superior baseline stability expected from high performance optical systems at an affordable price. Use of WindowsTM 95 and AtomicA's software Wizard function provides easy operation for system control and data processing. 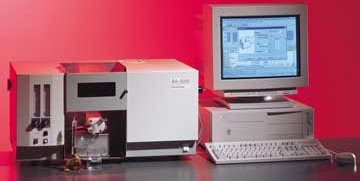 The AA-6200 uses the least linear bench space of any atomic absorption spectrophotometer in the world. In spite of its compactness, the performance and capability is superior. In fact, the AA-6200 outperforms other atomic absorption instruments many times its physical size.